The SDN-ready MX5 Universal Edge Router is a flexible, full featured MX Series solution for managed services and enterprise applications. 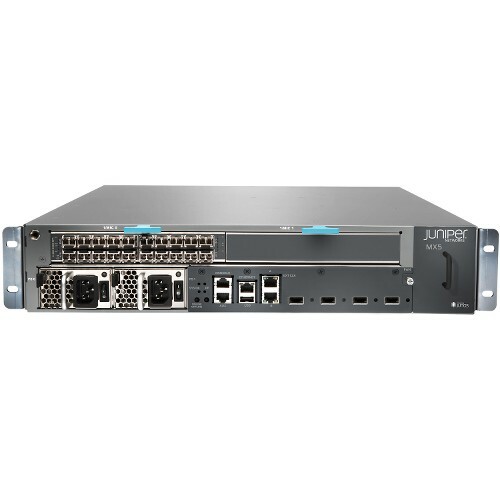 It is equipped with a user-configurable Modular Interface Card (MIC) slot for flexible network connectivity and an additional MIC slot in the rear to support a multiservice card for virtualized network services such as Carrier Grade NAT (CGNAT), stateful firewall, and IPSec. With a software upgrade that increases port capacity and performance, the MX5 is upgradeable to an MX10, MX40, or MX80. This enables customers to scale in bandwidth, subscribers, and services, minimizing upfront capital investment while ensuring investment protection that accommodates future growth requirements.